Take the “Bozen-Nord” autobahn exit from the A22 and follow the signposts directing you to the Eggen Valley and Obereggen and continue on towards the Lavazè Pass. From there, as described above, proceed westwards to the Jochgrimm (driving time from the autobahn exit: approx. 35 – 40 minutes). 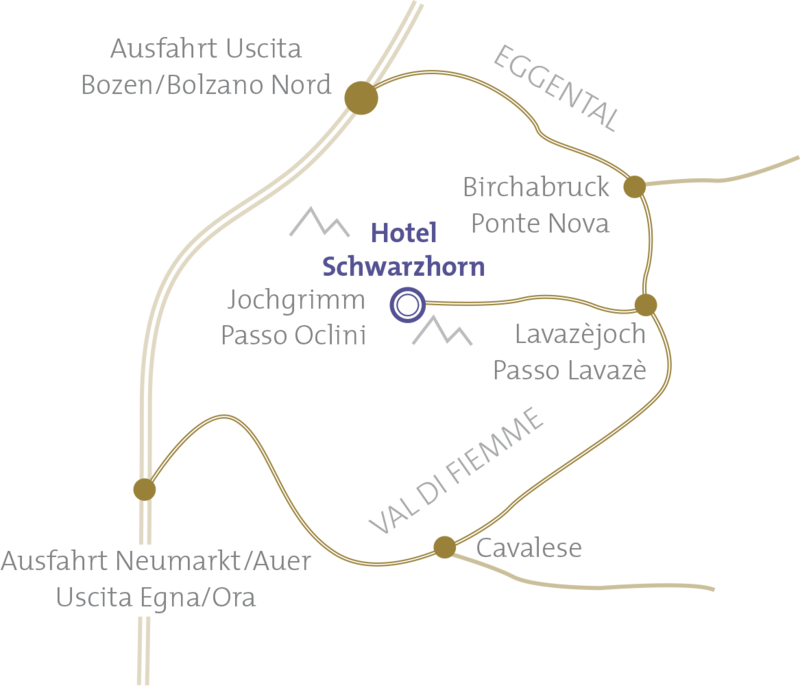 Take the “Neumarkt/Auer” exit of the Brenner autobahn A22 and continue via Montan to the Fleims Valley / Val di Fiemme. Continue on towards Cavalese. Just before you get to Cavalese, take the turn-off to Varena and continue on towards the Lavazè Pass. From there, continue westwards over the Pass road to the Jochgrimm parking (ital. Passo di Oclini) (driving time from the autobahn exit: approx. 45 minutes). When traveling by bus, we recommend coming via Bozen / Bolzano and the Eggen Valley. IMPORTANT when using a navigation system: The road to the Jochgrimm is incorrectly labeled on most electronic navigation devices. You should therefore select “Lavazè Pass” as your destination.